UFC 222 was originally slated to feature men’s featherweight champion Max Holloway putting his belt on the line against top contender Frankie Edgar. But when Holloway had to step out of the fight due to injury, the card underwent a major reshuffling. 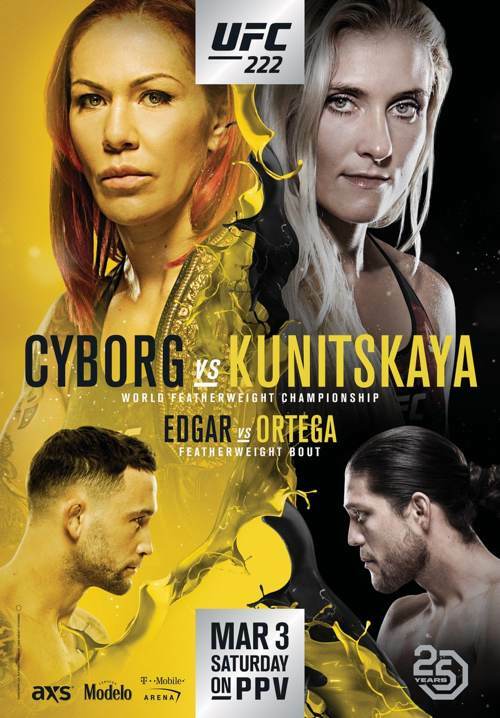 Women’s featherweight champion Cris Cyborg eventually agreed to save the event’s pay-per-view status by putting her belt on the line against fellow former Invicta FC champion Yana Kunitskaya in the UFC 222 main event. Not wanting to sit on the sidelines, Edgar also agreed to remain on the card, putting his title shot on the line against fellow featherweight contender Brian Ortega in the UFC 222 co-main event.